Natchitoches, Louisiana was the destination for our latest rambling. It’s the oldest town in Louisiana. The history, area plantations, water sports, and Northwestern State University are all good reasons to visit Natchitoches, but, no doubt, many will remember the city as the locale for the filming of “Steel Magnolias,” and the Festival of Lights each Christmas. We had seen the town at Christmas, but had never in the summer. For lodging we chose the Queen Anne Bed and Breakfast. When browsing the internet we found the Queen Anne and fell in love with the 1905 building and the charming interiors that were pictured. Another plus for this Be & Be is that there was ample parking for us to bring our small boat. 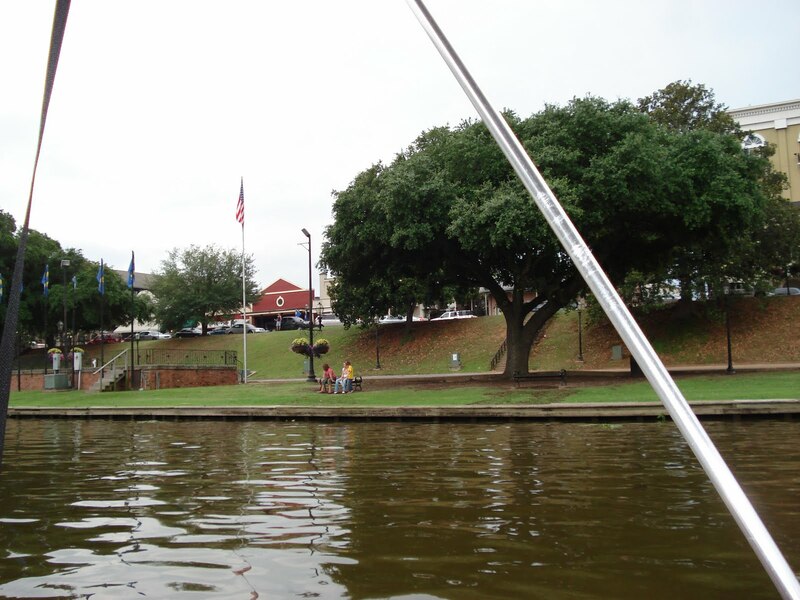 Natchitoches is a (leisurely) three to four hour drive from Baton Rouge. From I-49 take the Natchitoches exit (Highway 6) and proceed into town where the Queen Anne is located on Pine Street. This B&B is a great example of architecture common in the early 1900’s. The home has seen several uses and restorations in the last hundred years, but the owners have restored it to its original elegance. 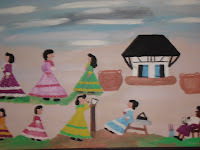 The paint colors and furnishings were authentic to the period. The Queen Anne offered a multi course breakfast served in the dining room that featured a crystal chandelier. Our room had complimentary wine, chocolates and luxurious bath products. The Jacuzzi tub was a real treat for tired travelers. The gallery was a perfect place to enjoy a glass of wine in the evening and coffee in the morning. For boat owners an excellent public launch is located right outside town. We had so looked forward to some leisurely boating on the Cane River. The Cane River, we discovered, is not really a river. It’s actually an oxbow lake formed when the Red River changed its course a long time ago. The water level of the Cane is controlled and about 25 miles of the waterway is navigable, down (south) to a little past Melrose Plantation. On our boat ride we saw both fisherman and pleasure boaters. We had a perfect afternoon that was overcast and there was a cool breeze on the water. Nothing compares to seeing this area from a boat. 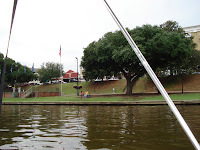 While we had been to Natchitoches before, we had never been on the lake. Our ride revealed the landscaped yards of the residents of the waterway. We even saw a wedding taking place in someone’s back yard as we drove leisurely downstream. Facilities are provided in the center of town for boaters to tie up and enjoy the local shops and restaurants. And, Natchitoches has many shops and restaurants. For dinner we chose The Landing, located on Front Street and a five-block walk from the Queen Anne. This restaurant is known for its seafood, steaks and jazz music. The food was excellent. The appetizer sized meat pies were to die for! The grilled shrimp and the ultimate steak dish were divine. The grilled shrimp speaks for itself, but the steak requires an explanation. It was an 8 oz. filet atop layers of creamed spinach and garlic potatoes. Several succulent fried oysters surrounded the dish and all was topped with a béarnaise sauce. Sooo good! Our waiter, a Northwestern student, recommended the bread pudding for dessert and we ordered one with two spoons. The pudding was warm and topped with baked meringue and a rum sauce. We enjoyed our meal with the wine that was complimentary with a coupon we received at the bed and breakfast. On our walk back to the Queen Anne, we passed by two historic homes that were the sites of wedding receptions. Natchitoches in June seems to be a popular wedding destination. The historic district, with its manicured riverfront park and wrought iron ornamentation, is magical with twinkle lights at night. The breakfast the next morning was served in the fine dining room of the Queen Anne. We started with a large serving of mixed fruit, an exotic juice that we were told was orange and cranberry mixture, and coffee. The second course was an upside down blueberry pancake. We also had sausages and there was a fruit garnish. The hostess, Cathy, kept the coffee and the food coming as we dined and chatted with the other guests. Cathy was kind to share the blueberry pancake recipe with us. We are hoping to recreate the dish at home. It won’t be the same as eating it at the Queen Anne, but maybe the taste of it will jog some good taste memories. Before our trip back to Baton Rouge we made a stop at nearby Melrose Plantation. Melrose was the home of the Clementine Hunter, a descendant of slaves who became a famous folk artist of the area before she died at the age of 101. Melrose has become a national historic site and is being preserved by the Association for the Preservation of Historic Natchitoches. 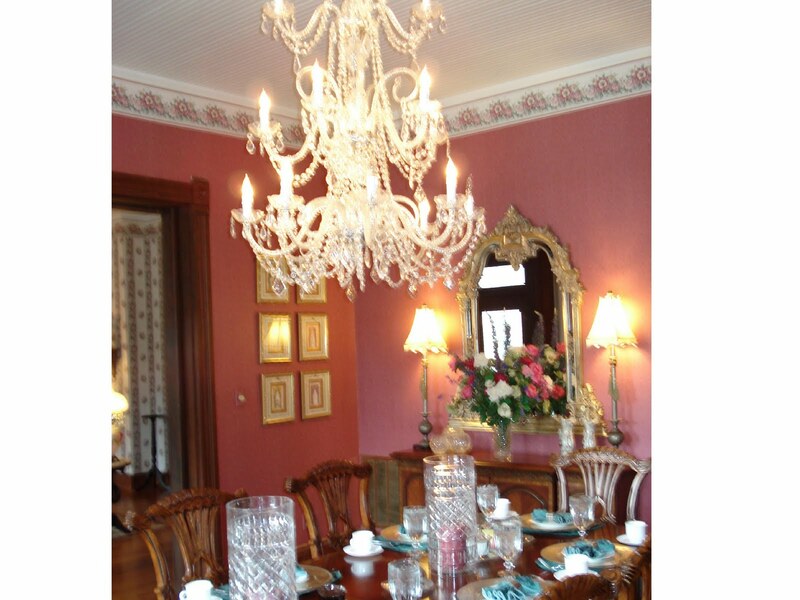 The plantation is Creole in its history, and the tour came with the fascinating stories of all the previous owners. Our guide was a descendant of the original owners and she was delightful. She was a Katrina transplant who made her way back to relatives after being displaced by the storm. We were allowed to take photos and enjoyed seeing some original Hunter art. Then it was back to Baton Rouge until we get the urge to venture out on another Weekday Rambling.